See Brittany’s full post here. Justine and I have wanted to take cherry blossom photos for years now, but it just so happens that every year one of us is out of town and ruins the whole thing…and it doesn’t help that our blossoms last for only two short weeks either! We (Justine) found this awesome spot in one of the residential neighbourhoods lush with blossoms and I could not believe how fortunate we were to have the place to ourselves (a hidden gem if I ever saw one)! When I first shared these on Instagram I had so many messages asking where it was – but of course, by then, they had all already fallen. We had such an interesting visit in Chianti, mainly because of this place we stayed…yes we stayed on this estate! From the photos I realize it looks very grand and luxurious, but there was definitely more to it than that! Our AirBnB (you heard that right, this was listed on AirBnB) was actually a winery! Before that it was…a monastery! We stayed in a house that used to be the Bakers quarters, complete with a massive open oven for baking bread. Florence was one of our last stops on our Europe trip. Although we were only there for a day, I’m so glad we got to experience a truly one-of-a-kind place! Unsurprisingly we left Cody at a museum by himself while we explored the streets and took photos. That man can spend a LONG time in a museum! We went to many different museums during our travels and while I do enjoy them, a girl can only take so much! Meanwhile, Justine and I were on a mission to find the most photogenic gelato in Florence. I will count this a major success judging by the photo above! This was probably Justine’s third gelato of the day…the girl loves ice cream. The wonderful thing about travelling with Cody and Alan is that it allowed us to take photos together for once! I’m not going to try to play it cool here, we carried our heels in our backpacks just for these photos. I don’t regret it for a second. The most amazing part of our day trip was climbing the tower of the Palazzo Vecchio, which is Florence’s city hall. Here we were able to see an incredible view of the city’s skyline! While every other tourist was at the cathedral, we practically had the place to ourselves. It was the most incredible view to take in and one that I won’t forget anytime soon. While in the Tuscan country side we had to make a pit stop at San Gimignano, I’ve been once before and everyone I know thats been recommended visiting, so naturally we had to visit! Think rolling hills and amongst them, the most quant little village that feels like the equivalent of Disneyland, Italian style. Along with the stunning views, San Gimignano is home of the most AMAZING gelato shop, Gelateria Dondoli (world champions)! What I thought was just the sweetest thing ever, is that the owner actually stands outside the shop and greets every single tourist coming through his doors (in whatever language they speak too). It was just that extra little touch that made our experience so much more memorable. The gelato itself was absolutely incredible and I had the most amazing passionfruit of my life! One of the things I loved most about this village is that it was small enough to get around in a day, unlike many of our other day-trips, we didn’t feel like we left so much unseen! That being said, there are plenty of side streets and small pathways to get lost on (in a pleasant sort of way). See Brittany’s original post here. Read some of her post below. If you caught the first part of this post, you’ve seen the beautiful Bed & Breakfast we stayed at in Tuscany. During our stay we took so many photos that I had to break it up into a few different posts. This one is all about the food…Our stay at Follonico was not only picturesque but full of seasonal, homemade, organic food as well. As someone who has worked for many small businesses in the past, their provision of locally sourced ingredients was not a detail lost on me. Breakfast included freshly made sourdough, organic fruits and greens from their own orchards, and eggs from free-range chicken and ducks. If I could eat like that everyday, I’d be in heaven! During our stay we were eager to capture some of the foods that were prepared for us. Needless to say, we were more distracted with eating it instead! The lovely owners did prepare a small picnic spread for us to enjoy with various meats and cheeses. Even though the rain foiled our plans of an outdoor picnic, we made good use of the cozy common room! Add the perfect local red, and we were set! A few words from Brittany of Life Set Sail about our trip to Follonico. Back in April Cody and I went on an epic European adventure with Justine and her husband, Alan. We met up in Greece and then made our way through Italy, exploring Venice, Milan, and Tuscany to name a few…Our favourite stay was at Follonico, a country house B&B built on a vineyard, in the most beautiful valley of Southern Tuscany. The slow paced living was a welcome change from from our days spent rushing from town to town trying to pack as much as we could into one day. 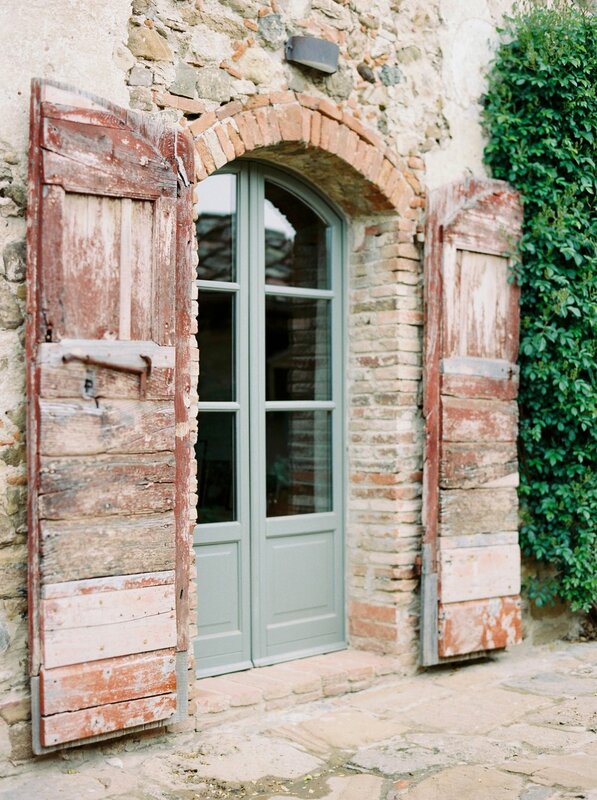 Upon first arriving we were all quite floored at the beauty surrounding us…the picture perfect stone house, the vines of roses covering stairwells to the suites, geese roaming around freely, the rolling hills that surround the property (along with the vineyard of course). It was like taking a leap back in time, a much more simpler time where life is lived with intention and disconnect from the technologies that surround us today. The beauty of this property inspired us to do things we don’t always take the time to…Cody spent hours reading one afternoon, perfectly placed in a chair overlooking the property and surrounding area. 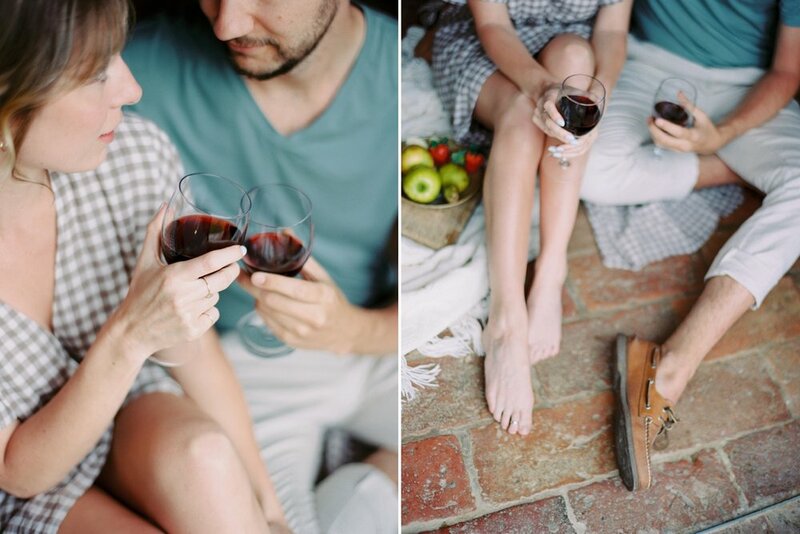 I joined him with a glass of red and sat quietly sipping away, just taking in the view – which was absolutely breathtaking. Along with everything being so visually pleasing around us was a true feeling of romance…being surrounding by so much natural beauty, it’s nearly impossible to not to feel something. Even though we were travelling with another couple, there was so much space between us (Follonico only offers four suites), that Cody and I felt very much to ourselves the entire stay. The experience was magical and truly one of a kind…and I haven’t even touched on the food yet (coming in part two)! I would go back in a heartbeat. View more property photos and check out the specs for Follonico on The Perfect Hideaway. 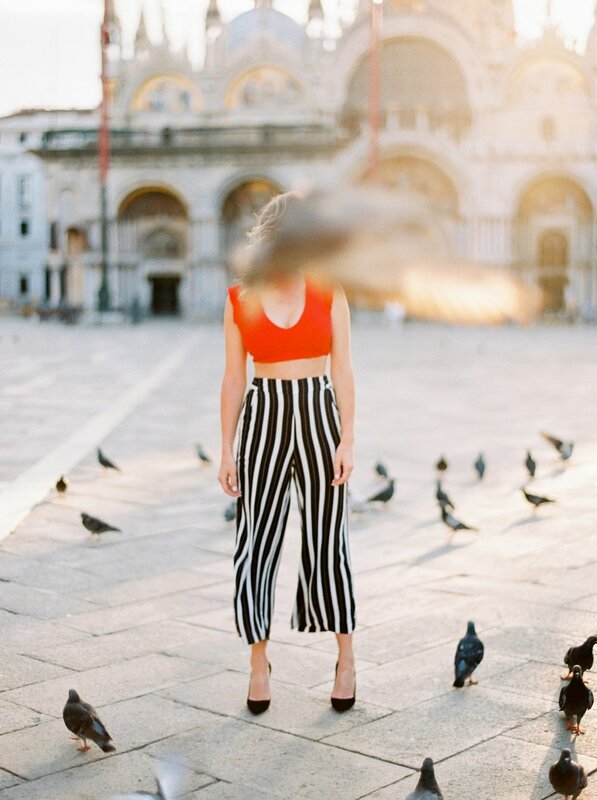 When you go to Venice you have to do some touristy things, I remember my first trip there probably around 15 years ago, and I distinctly remember feeding the pigeons. Brittany, however, is terrified of birds, so this was quite the adventure for her. While taking a few shots at sunrise in the square I was being a total pageant mom, the second that bird landed on her head I could see the look of sheer terror in her eyes and I just started coaching her to “smile, smize, look over there, etc” she just nervously laughed the whole time but it was an adventure none of us will forget!